Go right ahead. Call him a pompous egomaniac. Predict he's finally going to fall flat on his pretty-boy face. Say Mr. Moneyball finally outsmarted himself by trading two of baseball's best pitchers. Say the Braves fleeced Billy Beane for Tim Hudson. Say the Cardinals stole Mark Mulder. Is Billy Beane crazy? Hardly. Chortle. Snicker. Mock-wonder how Beane could be the star of a runaway best-seller, "Moneyball," when his Oakland A's teams haven't so much as survived the first round of the playoffs. Let Beane have yet another last laugh. And allow me to disqualify myself: I consider Billy Beane not just the smartest general manager and most fascinating front-office figure in baseball, but in all of sports. I find Beane vs. Conventional Wisdom even more compelling than Shaq vs. Kobe. I once was a short-sighted prisoner of baseball's stuck-in-the-past thinking. But Beane has taught me to think outside the tobacco pouch. I will never, ever get Beaned again. I doubted him once, in print. He made me look like nearly as big a fool as the GMs who scoff at or trade with him. In 2002, my computer screen nearly froze when Beane traded Billy Koch for Keith Foulke. What? Koch had won Rolaids Relief Man of the Year, saving 44 games for Beane's division champs. As a columnist in Chicago, I had watched Foulke twice lose his job as White Sox closer by losing control of his changeup. I told Beane about the nights I'd watched Foulke's batting-practice fastball get blasted like ballplayers on Rush Street. He warned that I had fallen into the typical trap of "taking snapshots" instead of analyzing Foulke's overall numbers. "They don't lie," Beane said, giving me one of those you-just-don't-get-it smiles that infuriate some Beane-blasting national baseball writers. 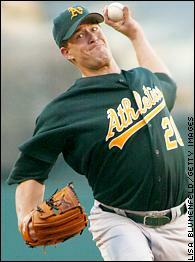 In 2003, Foulke won Relief Man of the Year for the A's. The only reason Foulke became a key reason the Red Sox won last year's World Series was that Beane couldn't afford to keep him. Koch flamed out with the White Sox and wound up getting released by the Florida Marlins after last season. So I for one did not ridicule Beane when he made the last two moves that Small Thinkers ever imagined he would. 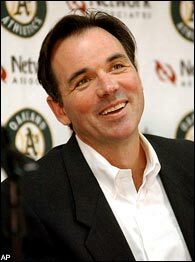 For the last three or four years, all I've heard about Beane from several national writers and GMs was that he "lucked into" his Three Aces and that anyone could keep winning 100 or so games a year with a rotation revolving around Hudson, Mulder and Barry Zito. Oh, how that steamed Beane. In fact, I believe Beane took some personal pleasure in telling selected GMs last August that he would auction off two of his three aces after the season. Beane's unique better judgment told him that was a shrewd move. But Beane's raging pride surely looked forward to removing his personal disqualifier. Now, no one can say Mr. Moneyball is just an overrated product of his Three Aces. In fact, none of the three was a Randy Johnson or a Curt Schilling. None of the three has overpowering velocity or no-hit stuff nearly every night. The only member of the rotation who can throw 98 mph was Rich Harden, "our best pitcher last year," said Beane. Harden will be Beane's best pitcher next season when, Beane warned, "we're going to be far more competitive than people think. And we will get progressively better over the next five years." Mark Mulder started the All-Star Game for the AL last season, but pitched poorly down the stretch. By last August, Beane didn't like what he was seeing. A team that looked to outsiders like it would win the AL West looked to Beane like it was in decline. Anaheim overtook the A's. Understand, Beane can be ruthlessly objective. Patience is the middle name of the GMs he beats. If Beane makes a mistake, as he did on last year's closer, Arthur Rhodes, he pulls off a three-way trade that sends Carlos Beltran, the prize of last July's marketplace, to Houston while the A's get closer Octavio Dotel. So Beane shocked baseball by doing, in his mind, the obvious. "It would have been much riskier," he said, "to do nothing and stagnate." Mulder, who had started the All-Star Game, was losing confidence even faster than he was games. An A's source said Mulder even tried seeing a sports psychologist, but that didn't appear to help. Mulder didn't win a game after Aug. 15. Beane said the rumors that Mulder suffers from a chronic hip injury are "completely false." Yet Mulder's nice, easy left-handed delivery turned into a herky-jerky tangle of question marks. Now that Mulder has been hailed in St. Louis as the Cardinals' one true ace, you wonder if he can stand up to the pressure. Hudson isn't much -- if any -- over 6 feet and weighs 165 pounds with seventh-inning sweat. In last year's clubhouse trophy case stood a little stick figure labeled "Huddy." The body whip required for Hudson to throw 92 mph has begun stretching his muscles past their limits. For the last two years he has battled various pulls, from groins to obliques. Last year, left-handers hit .298 against this right-hander. You wonder if Atlanta will find that Hudson's best years are behind him. What Beane calls a "trend line" was starting to descend for Mulder and Hudson. So while their career winning percentages still looked sensational -- Mulder's .702, Hudson's .659 -- Beane had the guts to trust in Branch Rickey's belief: "Trade a player a year early instead of a year too late." Beane's owner, Steve Schott, was not going to pay market value for Hudson when he hit free agency after next season, or for Mulder when it's his turn in two years. It isn't that Schott doesn't have the money -- he's filthy rich -- or make the money on his A's. On principle, he simply refuses to pay one Jason Giambi or Miguel Tejada double-digit millions a year. Schott and Beane make an odd but effective team. Schott believes that holding Beane to a small-market budget forces him to be even more clever than he is. And Beane would grow bored and perhaps careless if he could simply buy the best players. Beane's dream is to win baseball's World Series of poker while being dealt two cards to Boston's five and the Yankees' seven. Yet four years in a row -- 2000-2003 -- his A's lost a deciding first-round Game 5. Nine times in that span his A's blew clinching games. Beane had no true ace up his sleeve. Time after time, the Three Aces failed when it mattered most. Beane had seen enough. He offered all three, actually hoping that he landed the best deals for Mulder and Hudson. Zito had the best second half of the three last season and Zito, 2002's AL Cy Young winner, has proven to be the most durable by far. As a clubhouse source said: "He doesn't even know where the trainer's room is." 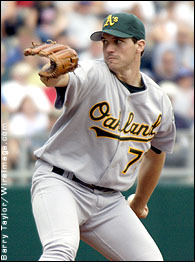 Only one of the Three Aces remains, Barry Zito -- but he should have plenty left in that arm. Zito is only 26. He'll be No. 2 in next year's rotation. For Mulder, St. Louis gave Beane his No. 4 starter, Dan Haren; a proven setup specialist, Kiko Colero; and 19-year-old catcher Daric Barton, whose Class A plate numbers (.313 average, .445 on-base, .511 slugging) were "Pujols-like," said Beane. Expect Barton to be in the big leagues by 2006. For Hudson, Atlanta gave Beane his No. 5 starter, left-hander Dan Meyer; his starting left fielder, Charles Thomas; and Juan Cruz, a live-armed reliever who can also start. Beane's No. 3 will be another of his draft discoveries, Joe Blanton, who pitched solidly for the A's in September after a rocky midseason big-league start. In fact, some in the Bay Area media called for Blanton to start a crucial late-September game instead of Mulder. The two unknowables are Haren, who pitched as if he belonged in the big leagues in September, and minor-league phenom Meyer. "Up to this point, their track records are flawless," Beane said. Including Blanton, Beane said, "We're talking about three of the top 10 pitchers in Triple-A last year." Once upon a time, so were the Three Aces. These three will cost Beane $300,000 apiece next season. Make that No Money Ball. "Our surrounding cast will be much better than Hudson, Mulder and Zito had at this stage," Beane said. "Our bullpen is so much deeper that it will help protect our young pitchers. We added an All-Star catcher [Jason Kendall]. We have a Gold Glover at third [Eric Chavez] and a Rookie of the Year at short [Bobby Crosby]. We added a guy who hit 19 homers at second [Keith Ginter]. We have a Gold Glove-caliber center fielder [Mark Kotsay] and we'll have a possible Rookie of the Year] in right ["Moneyball" product Nick Swisher]." So go ahead, laugh off this team as too young and powerless. Beane vows it will be his best yet -- if not next season, the next. I for one will not bet against him. You're still playing checkers. He's playing chess. Skip Bayless joined ESPN after a career as a sports columnist that includes stops in Miami, Los Angeles, Dallas, Chicago and San Jose. He can be seen Monday through Friday on "Cold Pizza," ESPN2's morning show, and at 4 p.m., ET, on ESPN's "1st & 10." His column will appear weekly on Page 2. You can e-mail Skip here.